NETWORK FINALS: UNDERCOVER BOSS gained 0.1 in final numbers, but there were 0.1 dips for THE ORIGINALS, REIGN and FOX’s run of the movie MAID IN MANHATTAN. CABLE HIGHLIGHTS: Syfy began its 3-night marathon of the entire season of 12 MONKEYS at 0.16/0.12/0.11/0.09. Last season, the show premiered at 0.14 and had a 0.12 finale. TNT’s NBA PLAYOFFS game dominated Friday cable at 2.02, and a post-game airing of THE DUNK KING was at 0.61. NBC Sports Net’s NHL PLAYOFFS game was at 0.57. On HBO, REAL TIME WITH BILL MAHER jumped 0.11 to 0.52 (the just-renewed ANIMALS ticked up to 0.09), and MSNBC’s RACHEL MADDOW SHOW remained in the Top 10 for another night at 0.35/2.7M, leading CNN’s 9PM ANDERSON COOPER 360 at 0.32/1.4M, and Fox News’s TUCKER CARLSON TONIGHT at 0.24/2.3M. 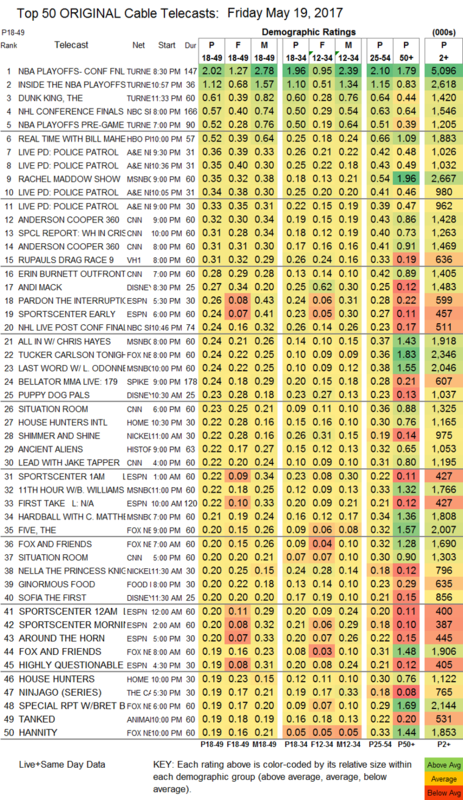 A&E’s LIVE PD divided its night into half-hour episodes at 0.36/0.35/0.34/0.33, compared to last week’s 3-hour 0.40. VH1’s RUPAUL’S DRAG RACE fell 0.06 to 0.31. 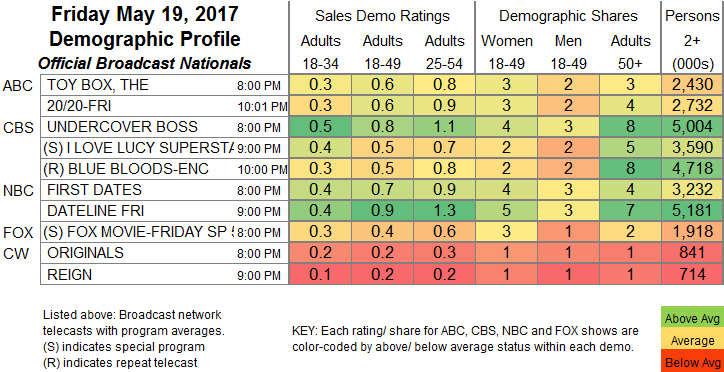 Disney Channel’s ANDI MACK was in the Top 20, up 0.03 to 0.27. Spike’s BELLATOR MMA was at 0.24. On HGTV, HOUSE HUNTERS INTL dropped 0.06 to 0.22, and HOUSE HUNTERS was down 0.08 to 0.19. History’s ANCIENT ALIENS lost 0.05 to 0.22. Food Network’s GINORMOUS FOOD shrank by 0.07 to 0.20. Discovery’s YUKON MEN ticked up to 0.18. We’s MARRIAGE BOOT CAMP fell 0.04 to 0.17.